What do pain, Celiac’s disease, world peace and yoga have in common? Well, they are all national themes for the month of September, AND they can all be improved with the help of a little herb called Gotu Kola- a sub-tropical creeping plant that thrives in swampy habitats. Maybe you have heard of this plant and its potential for improving cognitive function? It’s true that this tiny creeping vine can revitalize the brain and nervous system, increase mental concentration, and combat cognitive decline associated with aging. But it does much more than that! Gotu Kola is also a tonic for our blood vessels and connective tissue. As a systemic anti-inflammatory, it is helpful for autoimmune conditions. And it has a reputation for relieving depression, anxiety, and expanding consciousness. Read on to learn more about the wonderful benefits of this humble herb. Gotu Kola, also known as Brahmi (not to be confused with Bacopa, which is also referred to as Brahmi), is an important herb to the Ayurvedic lineage of herbal medicine. In fact, “brahmi” means “godlike,” which shows just how revered this herb is in India where it us used to aid in meditation. It is considered a rasayana, or a rejuvenative tonic for the brain and nervous system and it is said to re-vitalize the nervous system, increase attention span, and support graceful aging (5). Studies have demonstrated cognitive-enhancing and anti-oxidant properties in rats, supporting the idea that gotu kola could help prevent Alzheimer’s disease and other cognitive deficits that result from oxidative damge and neurotoxicity (1). More recently, a study out of Korea shows that components in brahmi/gotu kola show potential for supporting healthy memory. It is, afterall, the food of elephants, and we know that their memories are excellent (5)! This is why gotu kola is the main herb in our Sparkling Mind Tea formula. Gotu Kola also nourishes and tonifies our vascular tissues. According to herbalist Matthew Wood, gotu kola stimulates blood flow in the capillaries, reduces venous stagnation, improves cholesterol balance, helps break down aged red blood cells, reduces urea in the blood (acidity), and increases circulation to the extremities and the brain. (4). This makes gotu kola useful in any condition involving vascular insufficiency, leading to hypertension, varicose veins, hemorrhoids, or edema. As a nourishing tonic to the connective tissue, gotu kola can be useful in conditions involving damaged or inflamed tendons, ligaments and joints, such as arthritis, rheumatism, and tendinitis. This relief is further amplified by gotu kola’s systemic anti-inflammatory effect. Herbalist David Winston teaches that gotu kola is specific for “connective tissue disorders and skin conditions where the tissue is red, hot, and inflamed” (3). He uses gotu kola in many formulas for auto-immune conditions and skin conditions, including lupus, psoriasis and eczema. Many auto-immune conditions begin in the gut, from chronic inflammation (often related to food allergies/sensitivities) in the intestines, which leads to leaky gut, which leads to an over-reactive, hyper-sensitive immune system. Gotu kola, with its cooling and anti-inflammatry properties, can heal damage to the intestinal lining, making it useful for Celiac’s disease, as well as any condition with red, hot, inflamed tissue. This vulnerary, or tissue healing, action applies to internal or external wounds, speeding the healing of ulcers and burns and preventing scarring from surgery (1, 3). A nerve tonic, rejuvenant, sedative, and antidepressant, gotu kola has been traditionally used to modulate anxiety and improve mood. It is believed that these effects are partly due to an increase in neurotransmitter production (1). In both Chinese and Ayurvedic traditions, Gotu Kola is considered a supreme Shen (spiritual) and Sattva (reality enhancing) tonic herb. It has been shown to harmonize trans-hemispheric communication in the brain, which is likely why it is used by yogis, monks and meditators for its psychic and awareness-enhancing effects (2), and why we include gotu kola in our Yogic Tea. Brain hemisphere synchronization produces changes in brainwave states associated with expanded states of consciousness (2). The Hindus consider it a powerful herb for balancing and opening the crown chakra, which is one of the primary points through which intuition is believed to enter the mind/body (2). Gotu kola is also said to act directly on the pineal gland (brow chakra) (2). Taken long term, gotu kola may increase intuitive awareness, an idea that is certainly supported by thousands of years of antecdotal evidence. What an incredibly useful plant for our times! And a perfect ally to get to know this September, as we celebrate yoga, set intentions for world peace, and spread awareness around safe therapeutic options for chronic pain. Contraindications: Gotu Kola has no known toxicity when used in recommended doses (approx. 1 gram daily of dried leaf or 4-8 ml of liquid extracts) and there are no reports documenting negative interactions between gotu kola and medications (1). There is always the potential for allergic reaction to any herb, but this risk is greatly reduced when using whole plant preparations. Theoretically, gotu kola is not recommended for women who are trying to get pregnant. And little information is available on the safety of this plant for nursing mothers. My personal opinion is that in moderate doses, it is perfectly safe, but please do your own research and only do what makes you feel comfortable. Gohil, K. et al. (2010). 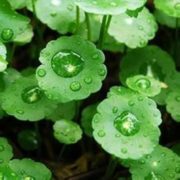 Pharmacological Review on Centella asiatica: A Potential Herbal Cure-all. Indian Journal of Pharmaceutical Sciences, Sept-Oct; 72(5): 546-556. 3. Winston, David. Herbal Therapeutics: Specific Indications for Herbs & Formulas, 11th edition. Broadway, NJ: Herbal Therapeutics Research Library, 2017. p.130.